Aside from coffee, potatoes are probably my biggest weakness in life. Put a potato in front of me in any form and I have a hard time resisting. I have a weakness for french fries and potato chips (especially salt & vinegar flavored!) but I would take these savory roasted potatoes over those any day! 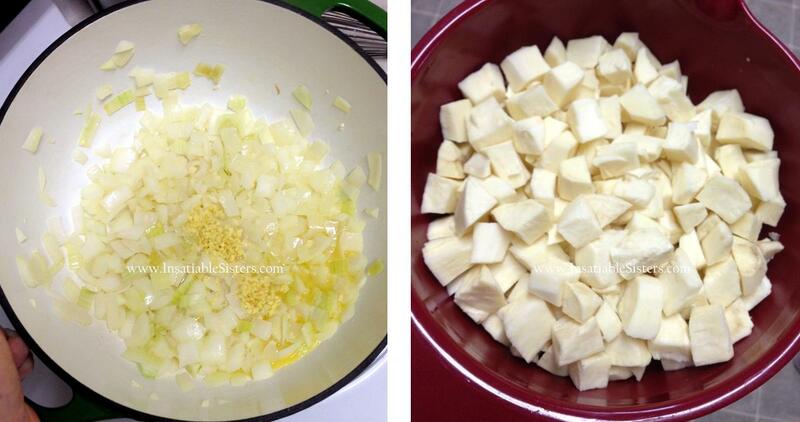 The sweet onions compliment the potato perfectly and the garlic adds a nutty flavor that completes the dish. The simple preparation and inexpensive ingredients make this a fantastic addition to your dinner repertoire. This method is really delicious with sweet potatoes as well. Enjoy! Scrub and quarter potatoes, or if using sweets, chop into approx 2×2 in chunks. Try to make the size as uniform as possible. Place potatoes and all other ingredients in a bowl or a large seal-able bag and toss to combine. Spread out in one layer on a baking sheet or roasting pan. I recommend using a baking stone for this as it reduces the chances of burning. Roast for about 45 minutes or until potatoes are tender. Carefully remove rosemary stems. Serve immediately and enjoy! Bring brown sugar, salt, 2 bay leaves, 1/2 tsp of ground coriander, 1 tsp black peppercorns, and 2 cups water to a boil in a medium sauce pan. Reduce heat and simmer, stirring occasionally, until sugar and salt dissolve, about 4 minutes. Transfer brine to a large bowl and add apple cider hard cider and 2 cups ice. Let cool. Place pork and brine into a large 2 gallon zip top bag, seal bag and refrigerate for 12-24 hours. Remove pork from brine and pat dry with paper towels. Let sit at room temperature for 1 hour. 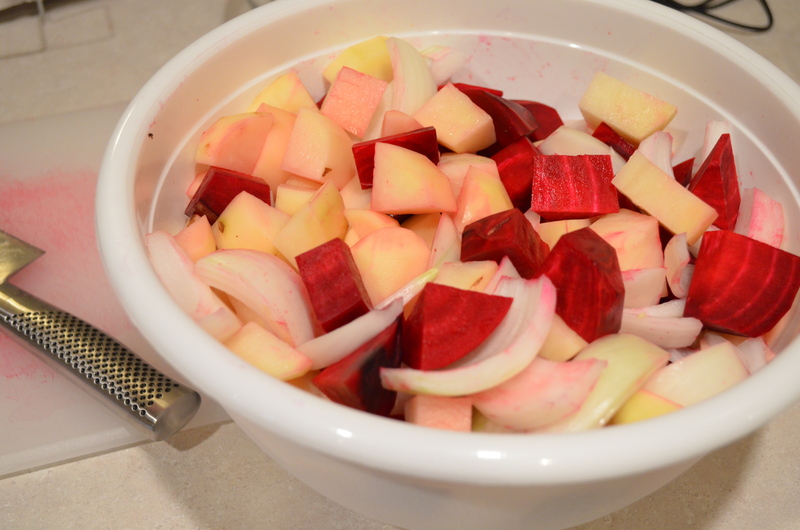 Toss potatoes, onions and beets in 2 Tbs olive oil in roasting pan, season with salt and freshly ground black pepper and set aside. Place oven rack in lower third of oven and preheat to 375 degrees F. Season pork with black pepper and 1 tsp of coriander. add remaining olive oil to a large skillet over high heat. Sear pork until browned on all sides. 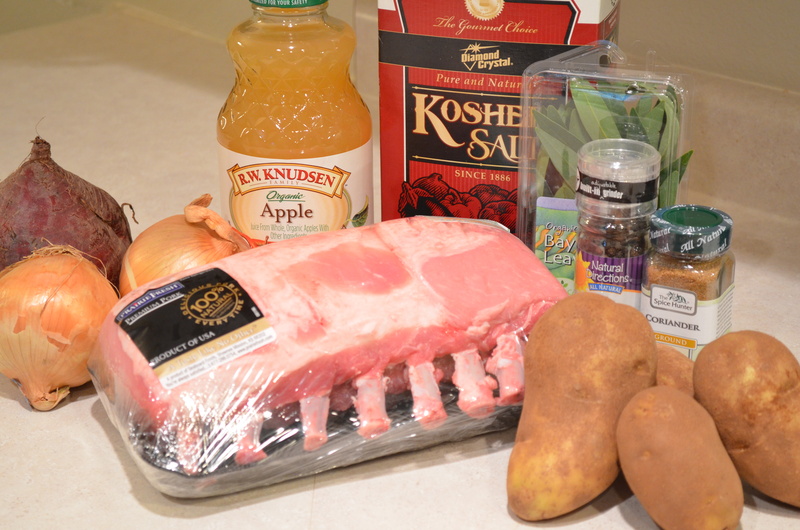 Transfer pork to a roasting pan and surround with vegetables. Tuck remaining bay leaves into the kitchen twine over top of pork. 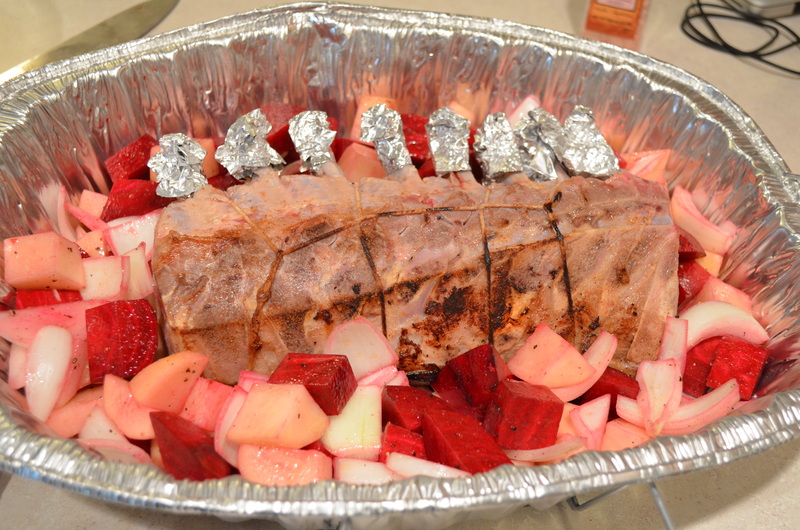 Wrap bones in foil to prevent burning, roast pork until an instant read thermometer reaches 145 degrees Fahrenheit. when done, let roast sit for 30 minutes before slicing. 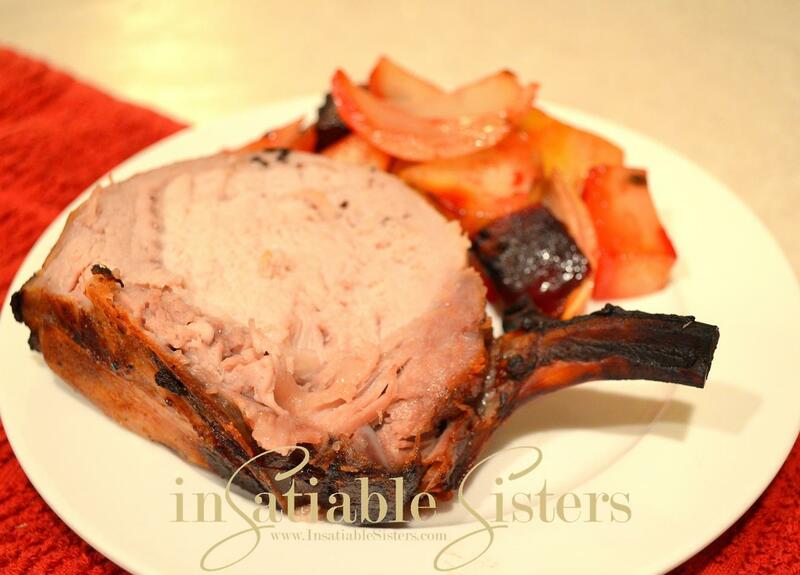 Vegetables may need to be roasted for additional time while pork is resting. Either variety, or even a mix, will do nicely for this recipe. 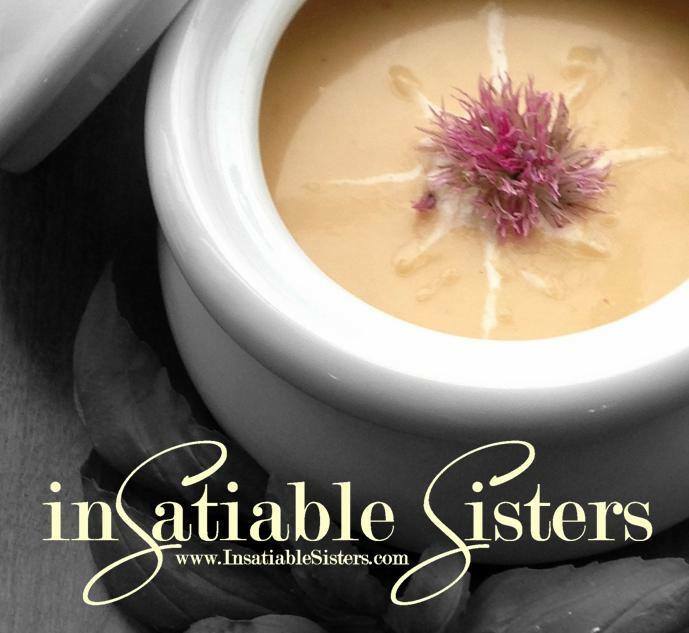 This bisque is not an original idea. I found it years ago in a magazine (which magazine, I can’t remember) and have made it many times since, with a few of my own adjustments. The beauty of this soup is that it is NOT sweet. The potatoes offer a subtly sweet base, but the ginger, lime and chipotle really take the forefront to create a savory soup that can be as spicy as you want it. Heat oil and butter in a stockpot over medium heat. Add the onion, garlic and ginger. Cook until onion is soft, stirring frequently, about 10 minutes. Add sugar, sweet potatoes, stock, vermouth, chipotle and salt. Bring to a boil, then reduce heat and cook until potatoes are soft. Remove from heat and puree the soup until smooth with a stick blender (you can use a traditional blender, but I find the stick blender makes much less of a mess). Return soup to a simmer, add heavy cream, lime juice and zest. Salt and pepper to taste. A sprinkle of chopped pistachios would make an excellent garnish. What’s in a name? There’s a 2-part story as to how this recipe got its name. Fresh, homemade salsa is one of the first foods that I started experimenting with. I thought my original recipe was pretty good, using fresh (un-roasted) tomatoes. Then my niece, Sophia, came back from almost a year in Guatemala and introduced me to their way of making salsa: roasting it. Since then, I have roasted my salsa ingredients, both in the oven and on the grill, and it tastes amazing. The second part of my story is this: A couple years ago, Sophie and I were making salsa together. Actually, I was making it, and she was hanging out. =) Once it was finished, we had about ½ gallon of red, spicy salsa. It was beautiful. After the salsa chilled for a bit, Sophie decided she wanted to have some with tortilla chips. She pulled that big bowl out of the fridge….and dropped it on the floor. NOOO! All of that time, energy, and those beautiful tomatoes and peppers all over the floor! Here’s the best part…I’m not sure if I’m allowed to tell you this, but she actually scooped a lot of it off the floor and ate it. Don’t kill me, Sophie! Since Sophie improved my salsa and provided me with a cringe-worthy story, she will be forever associated with this recipe, hence the name. Wash tomatoes and peppers. If grilling, arrange them directly on the grill rack. Oven users, arrange on a cookie sheet or other oven safe vessel. Make sure they have plenty of room to roast and do not stack. Allow to roast 15-30 minutes or until skin is blistered, TURNING THEM ABOUT EVERY 5 MINUTES. The turning is especially imperative for grill users. A little char is okay, but you don’t want blackened produce. You may want to rotate them to get an even roast, but be careful not to squeeze any of the juice out of the tomatoes! Once roasting is finished, ALLOW PRODUCE TO COOL COMPLETELY before handling. When they are cool, carefully peel off the outer membrane. For the peppers: cut them open and scrape out all the seeds. You may choose to use rubber gloves for this step. Cut into large chunks, toss them all into the blender with the garlic, and pulse until your desired consistency is reached. Dump the tomato mixture into a bowl, add remaining ingredients, salt to taste, and devour. Recently, I’ve become a little obsessed with fresh scones. My friend Danielle shared her recipe with me, and since then I’ve made several delicious variations using her basic recipe. In this particular creation, I’ve made a savory scone with rosemary, sharp cheddar and red onion. This recipe is quick and simple…only half hour to delicious homemade scones! I hope you enjoy it as much as I have! Mix all dry ingredients together (including rosemary). Add butter in chunks. Add egg yolk, yogurt, and onions. Combine all ingredients thoroughly using a pastry blender. Stir in shredded cheddar. Flour your countertop and form the dough into a long rectangle. Cut dough into 10 even triangles, then brush with egg white and sprinkle with kosher salt. Arrange scone triangles on a baking stone. Bake at 400 degrees for 15 minutes. Allow to cool directly on the stone. Enjoy!